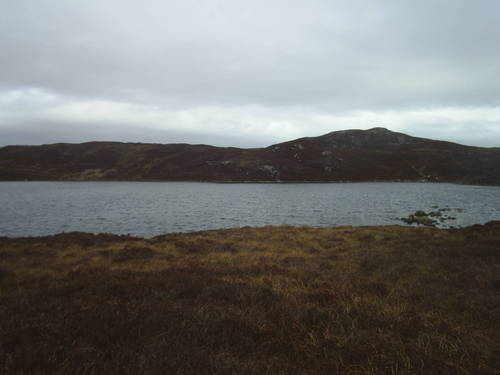 This loch (and others) is at the top of our hill a 20 minute hike away. The sun that hits our south facing hill is already warming the house, bothy and shed to a point where we use little heating. However the minute you head up the hill the cool breeze chills the air beyond belief and passing Loch Na Ma on the way to Crois Eilean a cold wind presents an uninviting picture to the spring flyfisher looking for rising trout. In a months time the margins of Loch Na Ma will start to weed up, midges will hatch and the trout will respond but not today. 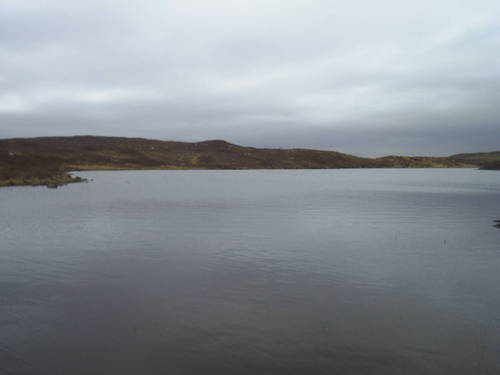 We walk on to the main part of Loch Crois Eilean, again the cold wind that is a blessing on a summers day is a curse in April. 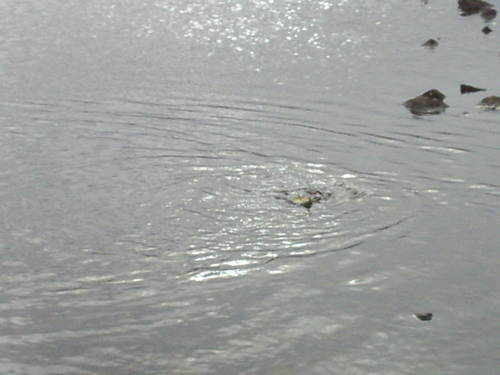 However one of the benefits of fishing a water many times over the years is that you always have a clue as to where to head. 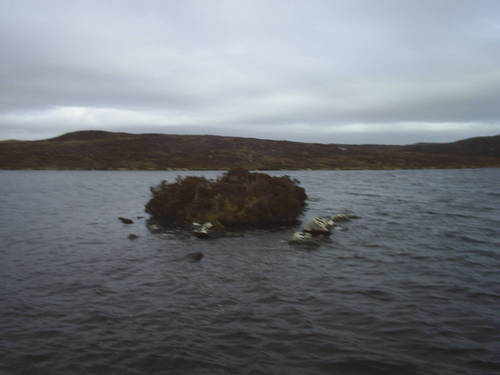 A small side arm of the loch weeds up in the summer months to a point where fishing is difficult, this is the clue you need to show that it is mainly shallow water. 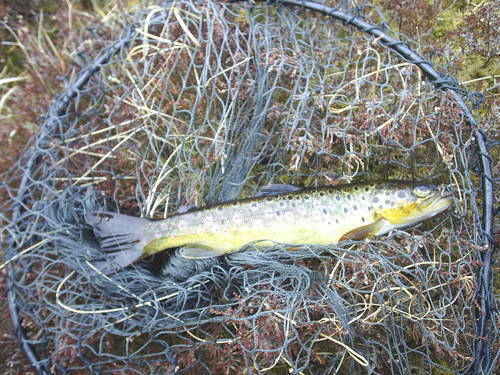 A loch or side arm that weeds up in the summer is always worth fishing in the spring. The shallow water heats up faster in the early sunshine and that starts the ever present midges to start to hatch which in turn gets the fish feeding. Even if they are not rising they will be on the prowl, looking for meal. The chop on the main loch is a light ripple on this side arm, an odd fish is rising but the cool air suggest that there will be not much of a rise today. Sometimes as the day lengthens the wind drops and there can be an evening rise to midge no matter how cold the day, but at 3 o'clock there is not much happening but at least the water looks inviting. Because I guessed we would end up fishing the side arm I tackled up with a 9ft #5 rod with a DT5 floating line, had we been fishing the main loch where longer casts are needed I would have used a 9 ft #6/7 rod teamed with the #5 line. 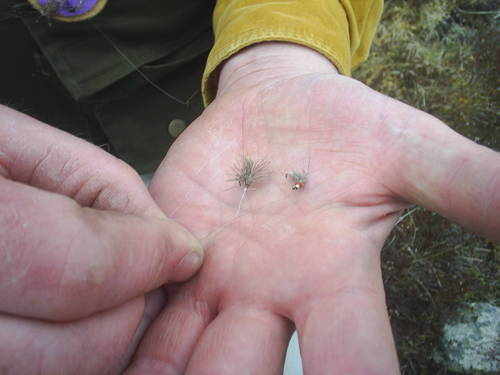 The lack of rising trout and hatching insects affects the choice of flies. A DEER SPIDER#14 (light ripple in a heavier ripple in would be a #12) goes on the dropper, this acts as a strike indicator and potential fish taker, 4 feet away on the point goes a GOLDBEAD HARE'S EAR #14, (again in heavier water a #12 with added lead might be needed) this all round nymph, shrimp, swimming pupa pattern will tempt fish on any water, near the surface or 3 foot down.